The long polar night was not yet over in Igloolik when I decided to visit this eastern Arctic community, 870 kilometres northwest of Iqaluit, in early January 1997. I’d heard about its ceremony to welcome back the sun, and for years I’d wanted to visit Igloolik, because it was supposedly the most “traditional” place in the region. In Igloolik, residents spoke the purest dialect of Inuktitut, so my Inuktitut teachers told me. It was a community that still kept Inuit traditional culture alive, I heard. And I’d been watching a television series called Nunavut: Our Land, by Igloolik filmmaker Zacharias Kunuk, which made me want to see that landscape and its people for myself. When I was in Igloolik, I stayed with the local Anglican minister’s family at their informal bed-and-breakfast — the only place I could afford. I’d come on a shoestring budget, patching together contracts from CBC radio and Canadian Press, and cashed in some frequent flyer points to get there. Rev. Dana Dean baked bread daily. His puffy warm loaves were something to look forward to. But my basement room depressed me. If I was lucky enough to be there in the middle of the day, I could see a bit of reddish twilight through its two windows for a few minutes. The rest of the time my view on the world was dark, with a veil of ice and snow. In fact, it seemed that I could always feel the minus 40 C cold through the walls: It chilled me even as I lay on the bed rolled up in my down sleeping bag. I arrived on a Friday, spending the weekend mainly trying to get my bearings in this dark and cold place. I’d read about Igloolik’s unusual stone church, but when I found it, clearly no one was using the church any more for worship: The low, curved stone walls were covered in a layer of ice and huge drifts were banked up against the sides. Inuit built the church at the behest of one of the Catholic missionaries. Later, they wanted to tear it down: It was too hard to heat and kids climbed up the drifts to jump on the roof. Someone could get hurt, I heard. Few people were out on the slippery, ice-packed streets of Igloolik when I ventured around town. Wind was blowing off the sea ice and it swept freezing crystals of snow along in its path. Over in the east, a bloodshot light stained the blowing snow pink. On the Monday following my arrival, when the sun finally peeked over the horizon, its return was supposed to be a reason for celebration. A qaggiq, inspired by the gatherings Inuit used to hold out on the sea ice in a huge snow house, had been scheduled for that evening. It would be held in the school gym, though, not in an igloo. But plans for that evening’s Qaggiq were quickly shelved when the community ended up mourning the sudden death of a young man who died from a drug overdose. Qaggiq organizer Louis Tapardjuk told me that going on with the celebration later in the week would be important for everyone in the community. Qaggiq celebrations, he said, were based on information from the oral histories of Igloolik’s elders. 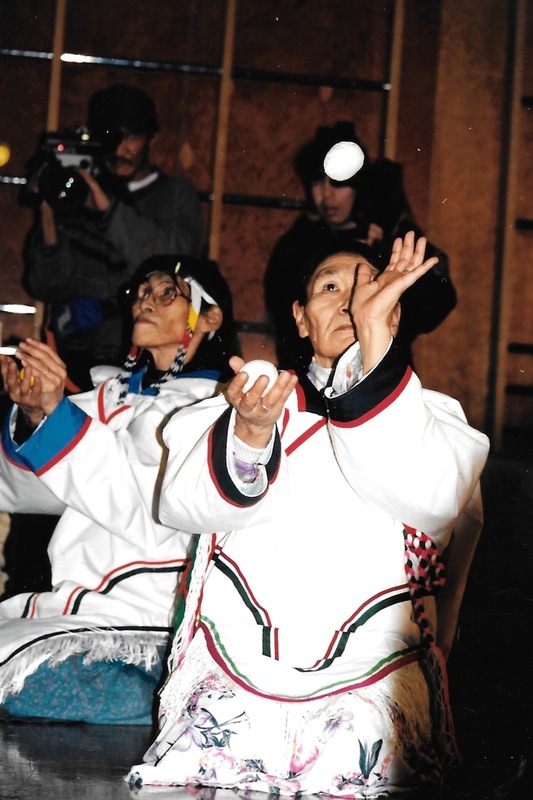 Iglulingmiut had stopped qaggiqs because of their shamanistic elements: drum-dancing, songs and story-telling. When local researchers began to interview elders in the late 1980s, these forgotten traditions were rediscovered. Before hearing the elders’ stories, he had no knowledge of January’s qaggiq ceremonies. Elders told him how, on the day of the sun’s reappearance, children would run to each igloo and blow out the wicks on the stone lamps, known as qulliit in Inuktitut. Then, new wicks would be set into place and relit from a single ceremonial flame. The long, dark time of the year was an anxious time, said elders. They remembered playing cat’s-cradle string games to catch the sun and prevent its disappearance. Then, near the end of the polar night, they would cut up their ajaraaq strings and begin, instead, to play an version of the ajagaq, a cup and ball game, in which a bone used to be thrown up in the air and speared with a stick, to encourage the sun to rise. Elders also remembered that people scanned the skies intently, looking for signs that the sun would return. When the morning stars, called akuttujuuk, stayed out even during the brief twilight, they knew that sun would soon return. “Akuttujuuk appear. Yonder the daylight, A-ya-ya. It is a joyous feeling that I will go on living,” goes a traditional song. With the promise of easier times ahead, elders said that children would smile, but with only a half-smile. One side would be happy because the sun was back, the other side straight because it would still be a long time before warmer weather would return. But I didn’t see a lot smiles of any sort when I was in Igloolik in 1997, except at the hockey arena or during bingo games. Over the past year, more than a dozen people had died, and many said it was difficult to pick up and go on. Several of the deceased were elders. Before the Return of the sun qaggiq, the 22 remaining elders of Igloolik were fêted at a traditional meal, followed by drum-dancing. They ate an entire seal, sliced open for the occasion. There were also shanks of frozen caribou, fermented walrus called igunaq, maktaaq and char, and lots of bannock spread out on plastic bags in the middle of the large, circular floor. The elders’ get-together was held at the Igloolik Research Centre, a building shaped midway between a mushroom and water-tower. The circular space on the elevated floor of the building suited the occasion. Elders sat around the edges of this room, much as they would have in an igloo. Their deeply creased faces hinted at a difficult life; their hands showed signs of hard labour. Their intricately embroidered boots and felt liners witnessed to their artistry. They all joined in to sing traditional a-ya-ya songs as drum dancers beat out a rhythm on round drums. Like an iceberg, 1997, “Qaggiq,” a four-part series, continues May 6.